Neil Cornrich & NC Sports, LLC: UFC's Brock Lesnar is no Stephen Neal! UFC's Brock Lesnar is no Stephen Neal! Brock Lesnar is either intentionally going overboard (likely) to hype his return to UFC or is a recent graduate of the Donald Trump school of exaggeration. Make no mistake about it, Lesnar is an impressive physical specimen and athlete. Lesnar was of course comparing his athletic versatility and accomplishments – he was a legit NCAA champion wrestler, a WWE heavyweight champion “wrestler” and former UFC heavyweight champion in the world of mixed martial arts – to the transcendent career of Jackson, the former NFL running back and MLB all-star outfielder. Clearly, that comparison is a joke. Jackson is universally considered one of the greatest athletes to ever walk the planet, his career cut short due to hip-replacement surgery needed following an injury suffered on a tackle while playing for the Los Angeles Raiders. Jackson won the Heisman Trophy at Auburn. He turned freakish speed and power into a MLB All Star Game MVP as a member of the Kansas City Royals. That same combination of skills made him one of the most feared running backs to ever play in the NFL, even through just a short, part-time career. In fact, not only does Lesnar’s athletic career fall short in comparison to a legend like Jackson, he hasn’t even accomplished as much as a far-less-heralded athlete that he knows quite well in former Patriots offensive lineman Stephen Neal. Interestingly, it was Lesnar whom Neal beat for the 1999 NCAA Division I heavyweight wrestling championship. 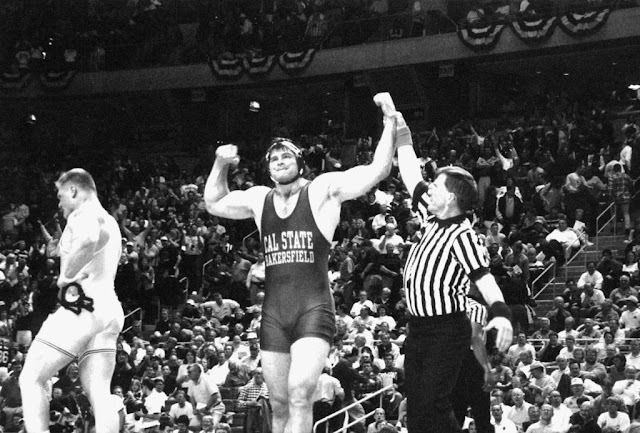 It was Neal’s second-straight title, helping him earn the prestigious Dan Hodge Award, known as the Heisman Trophy of college wrestling. Neal then signed with the Patriots in 2001 despite not having played football since high school in San Diego. After training camp he spent time on the Eagles practice squad before signing with New England’s active roster that December. He was inactive for all six games that year, including Super Bowl XXXVI. By 2002 Neal was in line for a starting job at guard, unfortunately he suffered a shoulder injury on a heady play in his first career start against the Packers as he tried to recover a New England fumble. The injury would sideline him for the rest of 2002 as well as 2003. After that, Neal would go on to start 81 of 86 games played for the Patriots before his retirement after the 2010 season. He collected his second Super Bowl ring, this time in his first year as a starter in 2004, in the XXXIX victory over the Eagles. Bill Belichick often jokes that Neal didn’t know how to put his pads on or how to find the practice field when he arrived in New England. After first seeing some time as a defensive lineman, he became an athletically gifted guard and core leader of the Patriots offensive line. It’s hard to imagine just how good of a football player Neal could have been with some college experience and were it not for the injuries he battled throughout his career. While Neal was finding NFL success, Lesnar wasn’t so lucky. The big man tried out for the Vikings in 2004 as a defensive lineman but did not make the team. And though he’s a mega-star in WWE and UFC due to his size and athleticism, his MMA record is a mere 5-3. Lesnar is all about glitz, glamour and hype; Neal is legitimately one of the greatest all-around athletes to have passed through the Patriots dynasty in Foxborough. Oh, and he just happened to be one of the nicest men to make his way through New England as well. No, Brock Lesnar, you are not the modern-day Bo Jackson. You’re not even the modern-day Stephen Neal, the guy who beat you for an NCAA title and put forth an NFL career that you could only dream of. But good luck with your return to MMA and hyping up your July 9 UFC 200 fight with Mark Hunt. You’re off to a good start.